During this retreat you will be sitting meditating twice a day, first thing in the morning and again before dinner. This routine will give you a taste of what daily meditation is like and it will give you a good foundation for continuing a regular meditation routine either in a group or alone at home. Special emphasis is placed on breathing and on a correct and comfortable posture – ideally you will sit on a meditation cushion or meditation stool on the floor but if this is not possible a chair can be used instead. 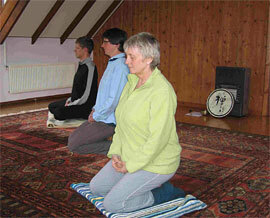 Each one hour sitting is broken up by a short walking meditation and rounded off by chanting. There is a minimum of ritual, which serves to focus the mind. Simple yoga and qi gong exercises will be used to help improve the meditation posture, if necessary. You are encouraged to go hiking around the peninsula and enjoy the wilderness and stillness of Scoraig. Breakfast and dinner will be prepared communally and lunch will be help yourself or packed to take away. Evening can be spent discussing meditation and, if you are interested, aspects of Buddhism. 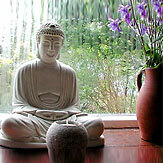 The programme is flexible and relaxed and suitable for both beginners and people with meditation experience. Kathrin has been involved in Zen meditation groups for over two decades, mainly of the Soto Zen tradition introduced to Europe by Taisen Deshimaru. She is a third-generation Buddhist who has travelled widely, especially in India and Nepal, where she worked with tribal people holding animist beliefs.